There is a special edition of GURPS Lite for Transhuman Space. You can download the PDF for free. 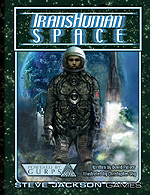 Transhuman Space won the Grog d'Or for the best roleplaying game, game line, or RPG setting of 2002. In the coming decades, technologies like genetic engineering, artificial intelligence, and nanotechnology will transform humanity. A strange new world is unfolding – nightmarish to some, utopian to others. Soon we'll have the power to reshape our children's genes, build machines that think, and upload our minds into computers. And Earth no longer confines us. Space tourism, mining the Moon and asteroids, a settlement on Mars: all are dreams poised to take wing. The universe of Transhuman Space is a synthesis of these two visions – a world in which ultra-technology and space travel fuse to forge a new destiny for mankind. Neither utopia nor dystopia, it is a place of hopes, fears, and new frontiers. It's the year 2100. Humans have colonized the solar system. China and America struggle for control of Mars. The Royal Navy patrols the asteroid belt. Nanotechnology has transformed life on Earth forever, and gene-enhanced humans share the world with artificial intelligences and robotic cybershells. Our solar system has become a setting as exciting and alien as any interstellar empire. Pirate spaceships hijacking black holes . . . sentient computers and artificial "bioroids" demanding human rights . . . nanotechnology and mind control . . . Transhuman Space is cutting-edge science fiction adventure that begins where cyberpunk ends. This Powered by GURPS line was created by David L. Pulver and illustrated by Christopher Shy. The core book, Transhuman Space, opens with close to a hundred pages of world and background material. The hardback edition includes a customized GURPS Lite – no other books are required to use it, although the GURPS Basic Set and Compendium I are recommended for GMs. The softback requires the Basic Set and Compendium I, but nothing else. e23 offers worldbooks, supplements, and adventures, in digital form, for Transhuman Space - as well as many of our other game lines. Surf our site for the files you want . . . and buy them now with a credit card or PayPal.